If you love hearing from everyday people with extraordinary ideas and expertise in their fields, strap in. TEDx Rockhampton is landing. TEDx Rockhampton will be held at Empire Apartment Hotel on May 30. Sam has an innate desire to challenge the status quo, and shift thinking through facing challenges, embracing uniqueness but working together. He was born into a farming family and has extensive experience across the agricultural sector, where he draws many of his lessons from. Sam is a natural communicator and commentates on agriculture across Australia and into New Zealand. He’s also a Director on the Board of the Future Farmers Network and is currently in the final stages of stretching his mind through an Executive MBA. Dan is a psychologist at Newstart Psychology & Counselling with expertise in adolescents, anxiety, child psychology, couples therapy, depression, HIV-AIDS, spirituality, stress, teenagers and more. He has ample experience administering psychometric tests to support the assessment of individuals cognitive and decision making capacity. Heath is an Educational Leader with a passion for equipping and enabling people to participate in life and learning. He is an advocate for parents, children, adolescents and teachers, serving on educational bodies and community groups. He currently teaches and mentors teachers in Central Queensland. Heath has published articles; speaks at conferences, seminars; and conducts professional development sessions on multitude of topics including Pedagogical Practices, Leadership Development, Strategic Planning, Curriculum and Parenting. He mentors leaders in schools, community and business. Heath has represented Australia in Land Sailing at the 2014 World Championships, finishing in the top 10. Ted holds degrees in Electrical Engineering and Economics. He is a Fellow of the Australian Institute of Management. He was awarded an Order of Australia in the General Division in 2004 for his contribution to industry. In 2001 he was named by the AFR’s BOSS Magazine as one of Australia’s top thirty business leaders. Ted made a career in management in the Electricity Industry in Queensland. He managed many power stations. Ted’s management career culminated with his term as the inaugural Chief Executive Officer of Stanwell Corporation. Stanwell Corporation when it was formed in 1997. He is now the Principal of Human Factor Australia working as a management consultant. He specialises in change management, strategic planning and executive coaching. Over the last decade or so he has coached more than eighty senior executives. He is currently the Chair of The Asset Institute. Ted is the author of a number of books and contributes a regular column to “The Art of Healing” magazine. 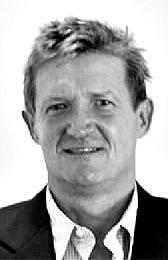 Ian Ogden is an experienced leader and change agent. His career has spanned hugely diverse roles in public, private and community settings. Ian has been CEO of two Qld local governments, and held executive positions including; Senior International Adviser, Consortium CEO, consultant to industry and government and, for the past 5 years, a ground breaking role as an Innovation Facilitator for the commonwealth government. Ian is an Adjunct Research Fellow with CQUni . He is a proven manager and builder of regional capital and he currently works in some of Australia’s most challenged regions. Ian has been a guest speaker and presenter at forums and conferences throughout Australia. Ben is a director and co-founder of Arris Water, a company that specialises in decentralised water treatment and recycling systems. He is also known as a researcher in Zeolites and other volcanic filter media, holder of two innovation patents for wastewater treatment technologies, co-developer and lecturer in the ICEWaRM Post Graduate course the Engineered Water Cycle, IWES Decentralised Wastewater Treatment Systems course and ICEWaRM Coal Seam Gas Water course. His specialties include treatment and reuse of coal seam gas associated water and design, construction, and operation of decentralised water systems; including Wastewater, Potable Water, and storm water. Judi is an avid collector of sea glass. Her formal background is high school principal currently executive coach. She has a Diploma of Teaching, a Bachelor of Education, Masters of Learning Management (Leadership) and is currently studying final subjects of a psychology degree. Although her first love is teaching and learning her passion is sea glass collecting. Sea glass collecting is a culmination of all she loves and works for. Through sea glass, Judi has been able to travel to exotic locations on treasure hunts, spend much time in and around the ocean, collect and organise old bottles and sand, investigate the history of glass, art and craft, exercise and walking long distances, spend time with her husband, learn and teach. Collecting sea glass has enabled her to live her values. Jo is the Rockhampton Hospital’s DonateLife Specialist Nurse with a passion for raising awareness on organ donation. She said only 53% of people know the wishes of their deceased loved ones preventing doctors from giving them the okay to process an organ donation.